Nestled against a hill side in Seac Pai Van Park in Coloane in a fan-shaped layout of about 3,000m2, Macao Giant Panda Pavilion is designed to take advantage of combining the terrain’s natural undulations with the architectural characteristics. 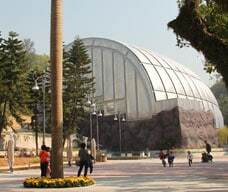 The pavilion comprises two 330m2 indoor activity quarters and a 600m2 outdoor yard for the inhabitation of the giant panda and a 900m2 indoor exhibit area. Two viewing paths of different elevations align along the front edge of the fan-layout indoor activity area, accessible to two streams of visitors. Internal facilities include a logistics centre with panda dens, bamboo-washing and storage quarters, feed preparation room, feed warehouse, control centre and veterinarian clinic, etc. Pavilion of Rare Animals is situated inside Seac Pai Van Park in Coloane and serves as a conservation site for rare animals. 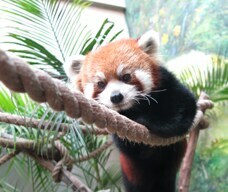 The exhibition area consists of 3 indoor and 2 outdoor activity areas to provide ample activity space for the red pandas. Many types of plants are planted in the activity areas to create an environment similar to the red pandas’ wild habitat. The temperature inside the pavilion is regulated to remain within 25°C to provide an ambient temperature that is most comfortable for the red pandas. Climbing facilities such as perches are also installed inside the activity areas for the red pandas to practise their climbing skills. The Macao Giant Panda Information Centre and Macao Giant Panda Gift Shop are situated inside the park too. The Macao Giant Panda Information Centre is a two-story building featuring multifunctional video rooms, exhibition areas, reading corners and network interactive areas. Intended as a platform for promoting public understanding of giant panda, it also hosts, among other activities, exhibitions and interest classes on a regular basis, in addition to providing information about giant panda. Located at the main entrance to the Seac Pai Van Park, the Macao Giant Panda Gift Shop is dedicated to selling gifts and souvenirs related to giant panda. It offers a large collection of giant panda gifts for visiting residents and tourists to choose from, including soft toys, bags, clothes, stationery and household items, etc. Admission fee is needed for the Macao Giant Panda Pavilion and Pavilion of Rare Animals. Macao Giant Panda Information Centre - 10 a.m. - 5 p.m.
Macao Giant Panda Gift Shop - 9:30 a.m. - 5:30 p.m. Admission: MOP10. Free admission for children of 12 years old or under and seniors of 65 years old or above.